1. Utilize Public WiFi - And I don't mean go and sit in a coffee shop every day. We use two different methods of accessing public WiFi from the comfort of our van. The first is to park super close to a building where you know there's free WiFi and just pick up and connect to their network due to sheer proximity. We've successfully done this at libraries, Starbucks, and Target. Of course, even if you're parked really close you can't always pick up a strong enough signal to connect. Thus enters method two: our WiFiRanger, which is a WiFi receiver that boosts weak WiFi from up to two miles away and overcomes the challenges of line of sight with a weatherproof rooftop mount design. Worried about the safety of using a public network to do things like banking? WiFiRanger secures your network with WPA2 encryption, firewall, and SafeSurfTM so that you can use public networks pretty securely. Basically, it uses public WiFi to create your own locked network that you get to name and set the password for. We haven't mounted it on our roof yet even though we've had it for a good six months. We just plug it in and then set it by a window or up on the dash. We always pick up a lot of networks (usually between 30-50), most of which are private, but a few of which are public. We mainly use it to pick up the WiFi from the hospital where we both work. To be honest, sometimes we still have trouble connecting to public networks with the WiFiRanger even when we're pretty close, but I think that's largely due to the fact that it's not on the roof like it's supposed to be! 2. Cook One Pot Meals - Even when you have running water, you usually don't feel like cleaning up a big cooking mess when living in a van and the answer is one pot meals. There are a ton of things you can cook in a single pot and then eat directly from the pot, leaving you with a minimal amount of clean up. Soups are a no-brainer and we also do a lot of curries, pasta, and rice dishes. Google one-pot meals and you'll find a ton of inspiration. 3. Public Parking - Finding a place to park overnight where you won't be hassled (hopefully) is always important when you're living in a van. If you're on the road a lot and can find a campground, pull off down a backroad, find some BLM land etc it's pretty easy. When you're in a city things get trickier. 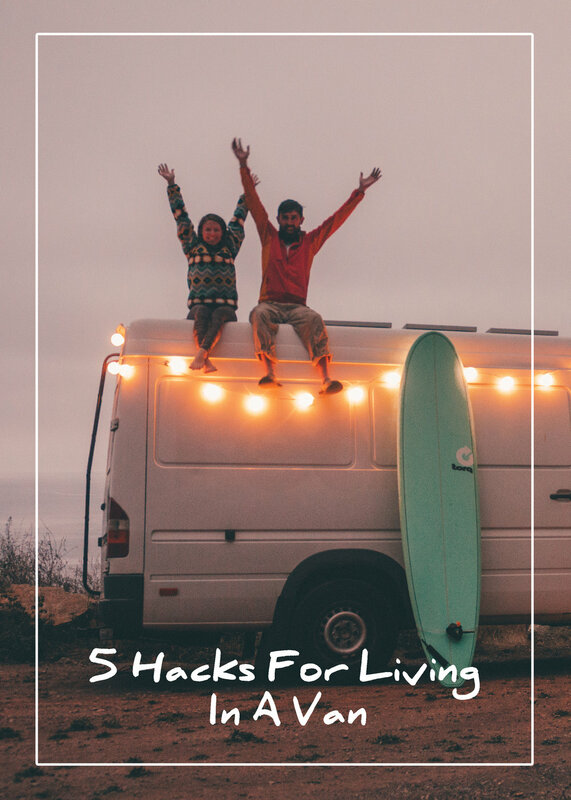 Since we live in our van in a city full time, here are our best tips. Find a Walmart to park at. Some people will confidently tell you that all Walmarts allow you to camp overnight, but it's not true. It's completely manager dependent and around 900 stores nationwide (approximately 23%) don't allow RVs to stay overnight. Now you might be thinking, well I guess it's a good thing I'll be staying in my van and not an RV. It's pretty obvious to anyone that a van parked anywhere overnight with shades down or curtains drawn have somebody sleeping in it. That's especially true if you're van is converted with things like solar on the roof. Once we made the mistake of staying at a Walmart based on the fact that there were already a number of RVs parked there when we arrived. At 6:00 am the manager and an assistant came out and started banging on the side of our van/the other RVs hollering, "This is management and it's time to move along! You're not allowed to be here overnight. Get up!!" Big deal? Not really, but it was an awkward encounter and a bummer of a way to start our day. Now we always check on this Walmart locator site that allows you to select what state you're in and see which Walmarts prohibit overnight stays. A family friend who drives his RV around the nation attending speaking engagements (he voluntarily stayed in Rwanda during the genocide - mad respect) recently told us that he always stays in Home Depot parking lots and has never been hassled, so we're going to try that next time we road trip. Another great spot is truck stops. You're guaranteed not to be hassled since people sleeping there overnight is kind of the point and you'll have access to bathrooms and showers if you're willing to pay. There is also usually a store selling the basics and a restaurant. The only downside is that truck stops can be noisy with trucks coming and going throughout the night, but if you're a deep sleeper or use something like earplugs/noise maker it's not a big deal. Parks are another option. Although plenty of parks don't allow overnight camping, some do and if they do they usually have signs. Don't see signs indicating one way or another? You could always contact the local police department (please don't call 911!) to find out for sure. When we were preparing to move into our van I read through all the city ordinances where we live trying to find out if it was legal to stay in your vehicle (it's not in some places) and found an ordinance where you can file a request with the police department to stay temporarily at a local park. If they accept your request they give you a permit to display so you won't get hassled. Takes more effort to do something like that and obviously it's not a long-term solution, but still an interesting idea. We recently started staying at casinos on road trips and have found that it's super easy to blend in. Seems like there are always tons of RVs and camper vans in their parking lots with people staying in them overnight who have come to gamble. You don't have to be as covert when everyone is running their generators and has their lights on. I can't imagine anyone staying in a van getting hassled unless you stay long term and they eventually notice you don't actually go into the casino. Another interesting option that very few people think of is hospital parking lots. Once we started living in one we realized what a great spot it was to spend the night. Since we both work at the hospital where we park our situation is obviously different than most, but there's really no way for anyone to know that a random van in a hospital parking lot has people sleeping versus someone in the ER, parents of an admitted child, or somebody visiting a patient. 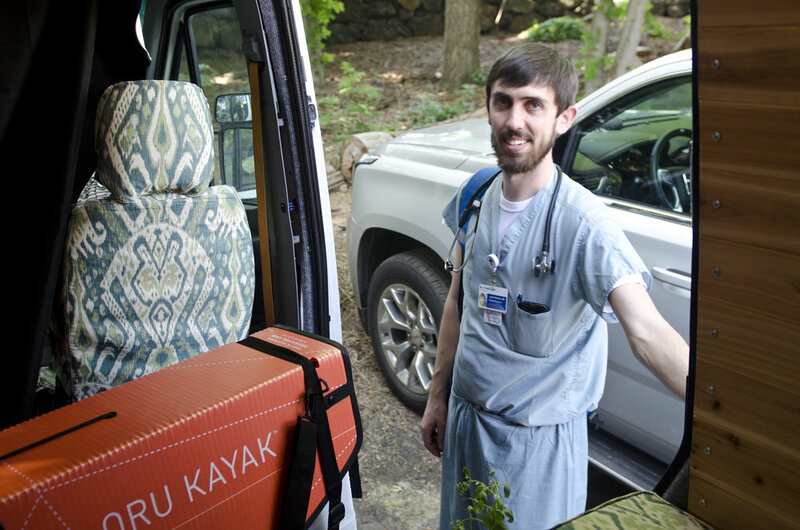 Now we're not suggesting that you show up to an ER and snag a great parking spot right by the doors. Have respect for people who actually need the hospital. However, more often than not you can find parking on the fringes and blend right in. Just make sure you're not in a parking lot that's for staff only. Usually, there will be a sign or you can look around to see if everyone seems to have parking tags or stickers. This plan of course once again relies on your ability to be covert unless you plan to lie about why you're sleeping at the hospital and our moral compass doesn't like that idea. So how do you stay covert? Once again, have a way of keeping light from getting out (we use snap-up blackout curtains) or just don't turn on lights. Move around carefully inside the van to avoid excess rocking. Talk softly and don't blast music or TV. All intuitive stuff. Last but not least is neighborhoods. You have to do a little planning though because people tend to be inherently suspicious of vehicles they don't recognize loitering around. The best way to do it is to arrive fairly late at night and leave pretty early in the morning. It also helps if you can find street parking that's not directly in front of a house. For example, along the side of a house, especially if the yard is fenced in. Once again, you need to stay covert unless you're parked at the house of someone you know. 4. Collect Bottles - If you're living in a van and you don't have a bathroom, keeping some bottles around are a must for those times when you're not far enough out in nature to wee outside and you can't find a public bathroom or it's just too inconvenient. I can guarantee you that almost everyone who lives in a van has peed in a bottle at some point. Wide mouthed bottles are obviously the best and glass bottles are great for rinsing out and reusing (sounds gross I know but the planet will thank you). Look up the Freshette for the ultimate female van peeing hack. 5. Get a Gym Membership - Before we moved into our van we got a membership at a gym, not because we suddenly had an increased desire to exercise, but because it's a perfect place to take a shower. We toured a bunch of gyms around town and each time asked to look at their bathroom situation, then picked a gym with lots of showers and toilets. If you're going to be driving around the country versus staying in one place, get a membership at a gym with tons of locations nationwide (think YMCA, Anytime Fitness, Snap Fitness, Planet Fitness).